This album is an absolute masterpiece, one that every deserving metalhead should have in their collection. Simply put, the music is overdosed with dissonance and heavy atmosphere of menace. Like a giant beast awakens from its slumber, Harnessing Ruin is the summation of the band's years long career. It's not too technical yet the intricacy is present throughout the songs. It opens up with the brilliant track 'Swarm of Terror', launching missiles of mayhem on unsuspecting bystanders. 'Our Savior Sleeps' is just awesome on its own; this song features climactic elevation before running over you like a giant slab of concrete. 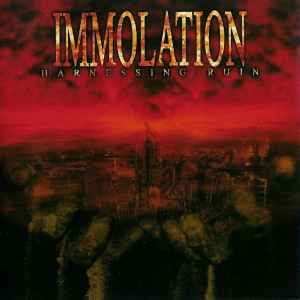 'Harnessing Ruin' is probably the best definition of post millennial death metal; cleverly structured solos overlapped with complex riff combined with barbaric drumming have made this particular song the brains of it all that hold the album together. The rest are just magnificent to even mention. If Benton sounds desperate to kill your belief in Jesus, Dolan simply sits back and sings forth the hymn of destruction with ease. Yes. Ross Dolan can actually sing and his voice is as evil as ever. Grab this album if you haven't!